Sometimes, inspiration comes from the most surprising sources. I was wandering the halls of O’Gourmet recently, wondering what I could make for a tantalising, delectable meal. I saw M. Seb (the cheese and wine maestro) … and stopped to have a chat. We walked into the cheese cave, and I started asking him to tell me about his favourite dishes – something that I (as a vegetarian) could make and enjoy. “Tartiflette!” he said, with great enthusiasm and excitement. This traditional Savoie dish is a layered potato gratin, given unctuousness and warmth from Reblochon cheese, cream, onions and lardons. Hmmmm. Lardons are pork fat, fried until crisp on the outside and melting on the inside .. and decidedly un-vegetarian! (But M. Seb is French, so I forgive him for being confused!) … However, Reblochon is a gorgeous, creamy raw-milk soft cheese made from the day’s second milking (when the milk is said to be creamier and richer). It is nutty and velvety, and has a soft lusciousness that is hauntingly beautiful. So, I was definitely interested, and I decided to try and think of a new take on tartiflette that would keep all that rich depth of flavour, and at the same time elevate it to new heights. I had some black truffles (also from O’Gourmet) that I decided to use in place of the lardons, and instead of onions (which would overwhelm the truffles), I used delicate and yet sturdy leeks. This is not a vegan dish – it just cannot be – but it is warming, full of love, easy to make, and joyous. You should serve it with a sharp green salad – arugula or young spinach – simply dressed with a lemon vinaigrette. You need the balance of something clean and bright to offset the richness of this meal. But oh, its worth it. Smooth and comforting, imbued with the scent of truffles, this vegetarian tartiflette is an instant classic. Its as good cold as it is warm, and can easily be assembled the day before, covered, refrigerated and baked a few hours before you want to serve it. Do try and let it sit for at least 20 minutes before serving – this allows the bubbling cream and cheese to solidify a bit and sink into the potatoes. Bake in a large ceramic ramekin or pot, and enjoy. It soothes the soul while pleasuring the senses. Such a wonderful combination! You can prepare the leeks up to two days in advance. In a large frying pan, melt the butter and olive oil together over medium heat. Slice the leeks thinly, and rinse them under running water to remove any grit. Saute the leeks in the melted butter until they just begin to sweat and soften. Pour over the 1/4 cup white wine, and season with a bit of salt and pepper. Allow the leeks to simmer / saute, stirring every so often, until they just begin to colour. Raise the heat to medium high, and brown the leeks for a few minutes. Transfer the leeks to a small bowl, and allow to come to room temperature. You can refrigerate the leeks, covered for up to two days. Peel the potatoes, and slice thinly. Submerge in water as you work so the potatoes do not brown. Bring a large pot of water to the boil, and quickly drain the potatoes from their water bath, and tip into the boiling water. Allow the potatoes to soften (but not fully cook) – about 10 – 15 minutes. Drain, and let cool for a few minutes. If you are baking the tartiflette immediately, preheat the oven to 200 C / 400 F, and prepare a baking sheet by lining it with parchment paper. Place your large ceramic ramekin or pot on top of the baking sheet (this will protect your oven should the cheese/cream bubble over – and it will!). Whisk the creme fraiche and cream together, and season lightly with salt and pepper. 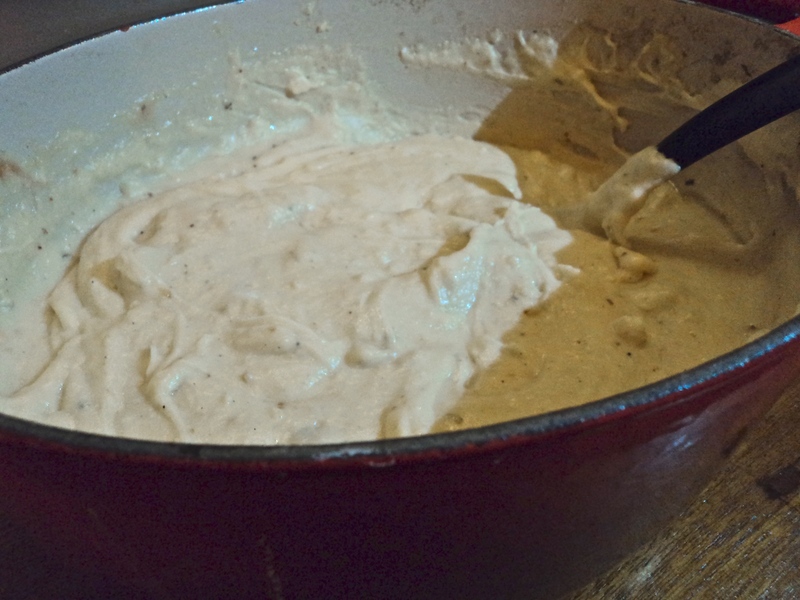 Ladle about a tablespoon or two of the cream mixture into the bottom of the ramekin. Place a layer of potatoes over this, a scattering of sliced truffles, a few thin slices of Reblochon cheese, and a sprinkling of leeks. Over all, spoon about 2 tablespoons of cream. Repeat these layers until you run out of ingredients – or reach the top of the ramekin – whichever comes first! Reserve about 5 – 6 thin slices of Reblochon to scatter over the top of the dish. Do note that you can cover the ramekin at this point and refrigerate up to 24 hours. I would highly suggest that you bake the tartiflette at least 2 hours before serving. This will give it sufficient time to set up. Bake the tartiflette in the hot oven for at least 1 hour, and up to 1 1/2 hours. The tartiflette is ready when the top is bronzed and bubbling, and the potatoes are soft and yielding to a knife. 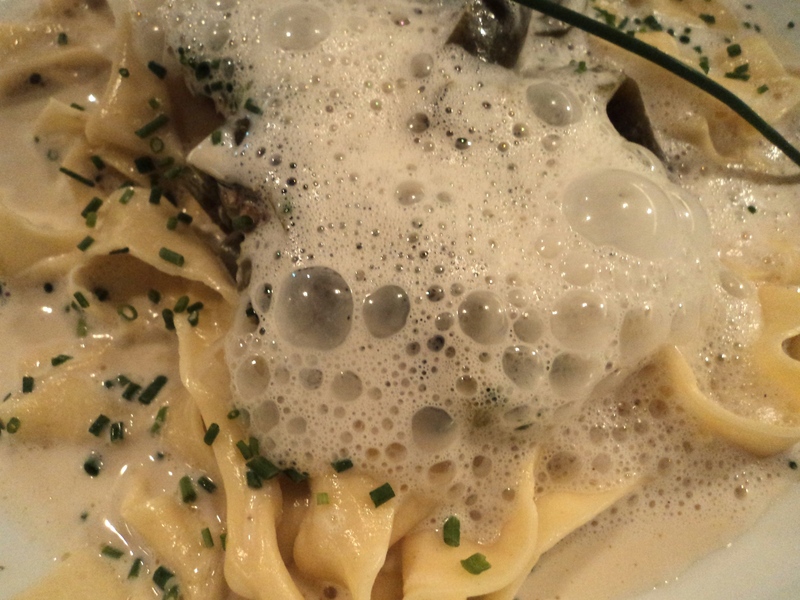 Do not be alarmed if there seems to be an inordinate amount of liquid and cream bubbling up. Remove the tartiflette from the oven, and allow to rest for about 20 minutes (and even up to an hour) before serving. The cream and cheese will settle, and you will have a wonderfully solid potato gratin. Serve with a bright, sharp salad for a wonderful and loving meal. I have always been fascinated by gnocchi – those delicate, pillowy little Italian dumplings made from flour and potato. They seem so simple, and yet they are intimidating. It seems that there could be so many ways to stuff it all up. Because the key to making gnocchi is in the simplicity – some recipes call for just potato and flour and a bit of seasoning – you need to follow directions really closely, and you need to have top grade ingredients. You can play around with gnocchi, but you really should try a basic recipe first. This one actually is quite simple and quick. It includes the addition of an egg (for richness and flavour) and some diced truffles, but actually, you can forgo them if you want to. Or add other ingredients – parmesan and butternut come to mind, or spinach and garlic. But do try a basic version first. You need to get the feel of the dough, and the lightness of the handling. Basically gnocchi have a base of potato that needs to be as dry as possible. There are a few ways to ensure that this happens. First of all, ensure you use starchy, not waxy potatoes. Russet are excellent. Next, bake the potato, dont boil it. Peel the potato after it has been baked, and then mash it lightly with a fork or put it through a potato ricer. Treat it very gently. Add the egg / seasoning if you are using, and salt and pepper. And finally, toss in the flour, a tablespoon at a time. This will ensure that you use the bare minimum of flour, which will avoid thick, heavy gnocchi, and a smooth supple dough. It sounds like a lot to remember, but really its common sense. Gnocchi are delicate, therefore you need to treat them delicately. Use your hands, so you can feel the dough coming together, and go slow, and soft. It will work out, I promise. Plus, a home made gnocchi, even if it is a little tough, is a thousand times better than a store bought one, any day! Pierce the potatoes with a fork, and bake in the oven for about 30 – 45 minutes, or until a skewer or knife goes all the way through with little resistance. Peel the potatoes while they are still hot. 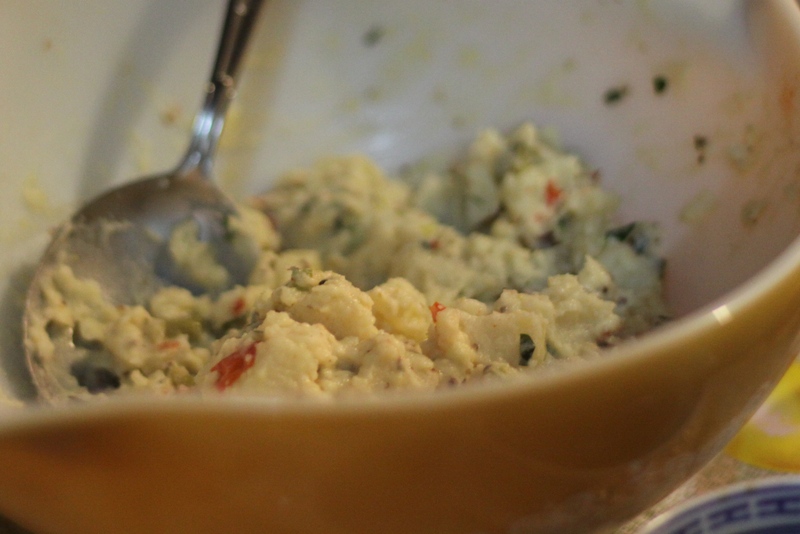 Put the potatoes through a ricer or mash very gently, in a large bowl. You dont want the potatoes gluey – fluffy is what you are looking for. A ricer is the best way to ensure this – and they are relatively cheap (I bought one from Ikea for less than RM50). Break the egg into a small separate bowl, and finely grate the truffle over. I use a Microplane lemon zester to get very fine strips of truffle, but you can even chop the truffle finely if needed. Add a generous pinch of salt and peper, and whisk. You could add half a teaspoon of truffle oil if you like, but the entire point of gnocchi is to ensure the dough is not too wet, and not handled too much. Make a well in the centre of the mixture, and pour in the egg/truffle concoction. Toss lightly with your fingers. The egg will not make the potatoes gluey if you have treated them properly to start with, but will definitely make them wet. Measure out your flour. You will probably only use about half a cup of flour, but its useful to have extra if needed. Add the flour to the warm potatoes and egg by the tablespoonful. Toss gently after each addition with the tips of your fingers. You will see the flour slowly incorporating into the potatoes. After about a half a cup of flour, knead lightly and bring the dough together. Add a little more flour, a tablespoon at a time, to get a smooth mixture that is not too sticky. Turn the dough out onto a floured work space, and let it rest for a few minutes. Place some wax paper on a large baking tin or cookie tray. Divide the dough into four equal portions, and work with one portion at a time. Roll the portion out into a long thin sausage, and dust lightly with flour. Using a sharp knife, slice into small gnocchi sized portions. I usually cut about 1 – 1 1/2 inches. Using the tines of a fork, mark the gnocchi on one side, and place gently onto the cookie tray. Let the gnocchi air dry for at least 10 – 15 minutes. You can store them in a ziploc baggie and freeze them, for up to six months. Or you can use immediately. To cook gnocchi: Bring a large saucepan of water to a rolling boil. Work quickly, and be ready to serve immediately. Gnocchi are not good cold! Have a warm bowl at the ready. Work with about 20 gnocchi at a time (or more depending on the size of your saucepan). Once the water is boiling, tip the gnocchi in, and allow them to bob to the top. This should take less than 3 minutes. Using a sieve, fish the gnocchi out, and place in the warmed bowl with a touch of olive oil or butter. Continue with the remaining gnocchi. Once all the gnocchi has been prepared, toss gently with warm sauce and serve immediately. I served a very simple sauce of spinach, wine, garlic and a touch of cream with these gnocchi. It was sublime! 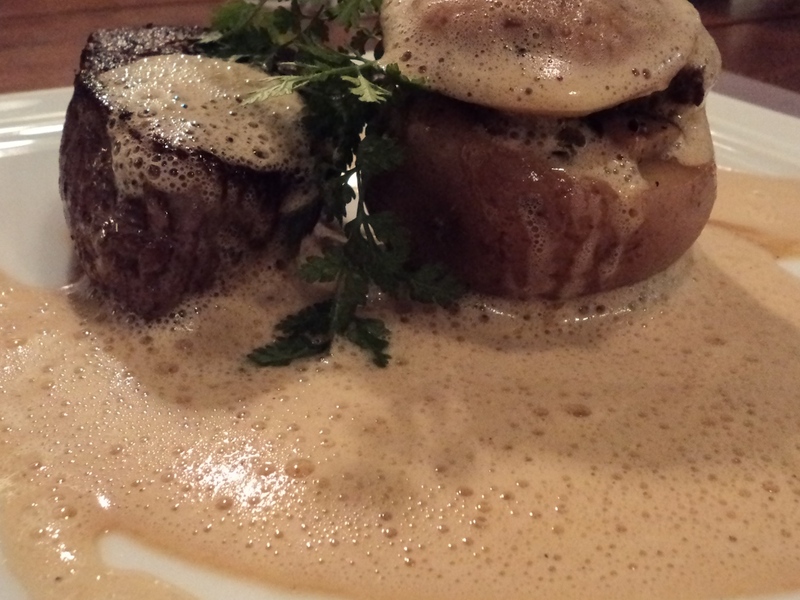 Sometimes a meal is a symphony of taste and texture and colour … and sometimes, its even more than that. A divine merging of friends and loved ones, family and comfort, intermingled with sublime food, cooked by an artist, with a sense of love and presence and drama. 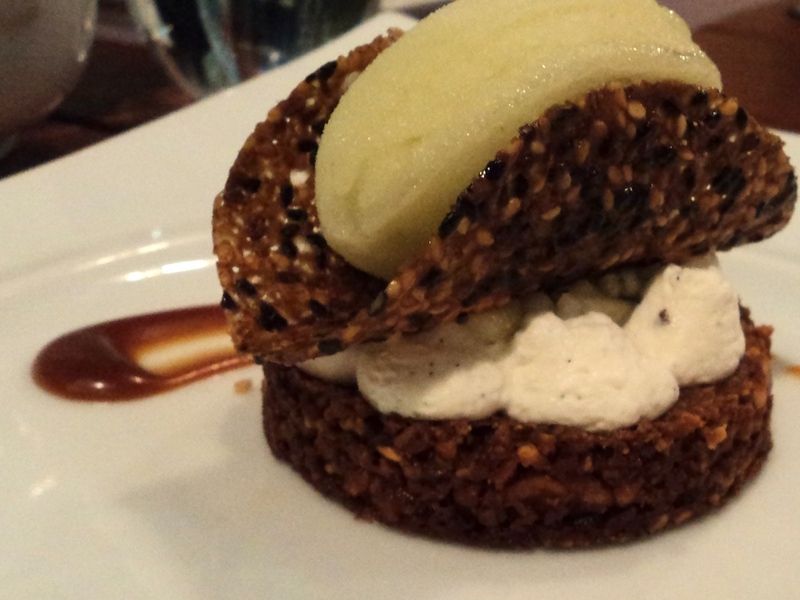 Last Friday night at Nathalie’s Gourmet Studio was like that – just pure joy. With Adi, Goddess, GoddessSpouse, AngelKitten, GoldenOro and Bubby, and MsTina… laughter flowed around us, wrapped us in warmth and happiness, and the food was a beautiful counterpoint to the joy in the room. 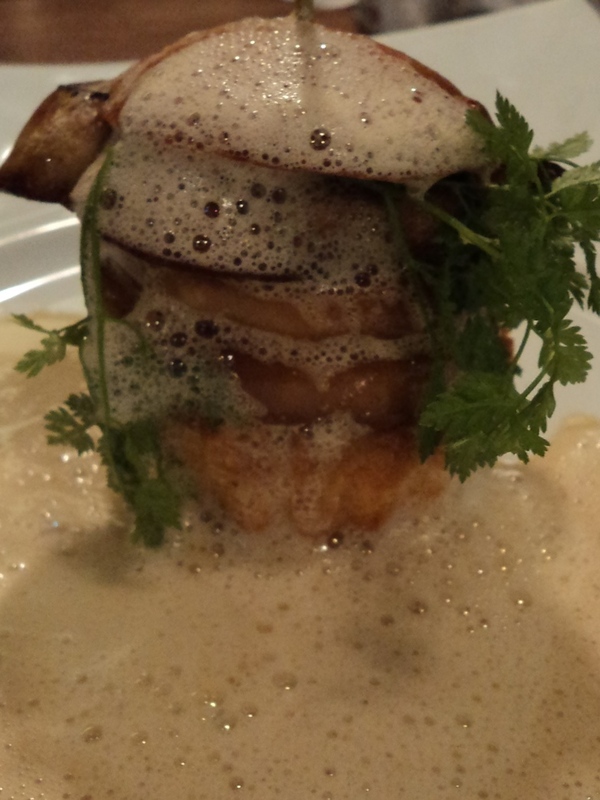 A potato galette with sauteed mushrooms, and a porcini foam. Simple, sensuous, lively flavours. Not too much, not too little. Just right to start with. This was the vegetarian choice and it made me happy. 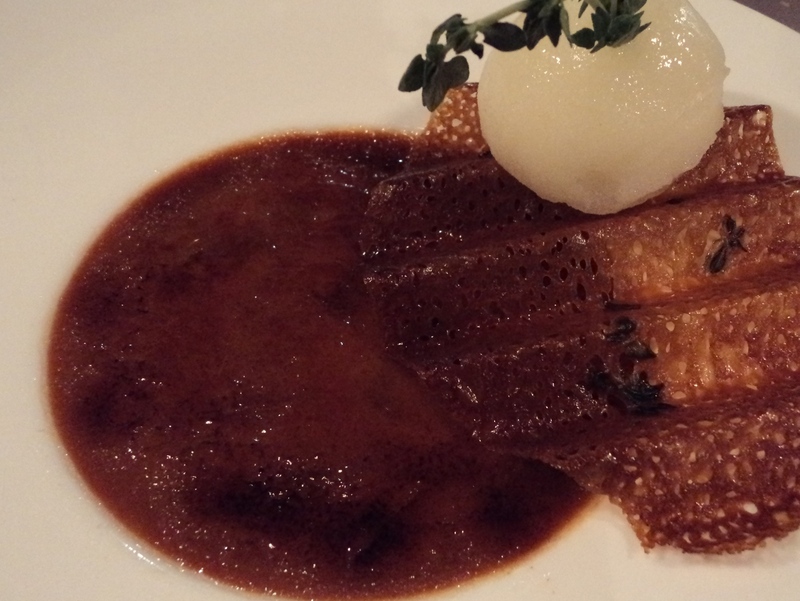 A new take on duck liver with brioche – the brioche made into an apple tart tatin. A clever merging of two very French tastes. 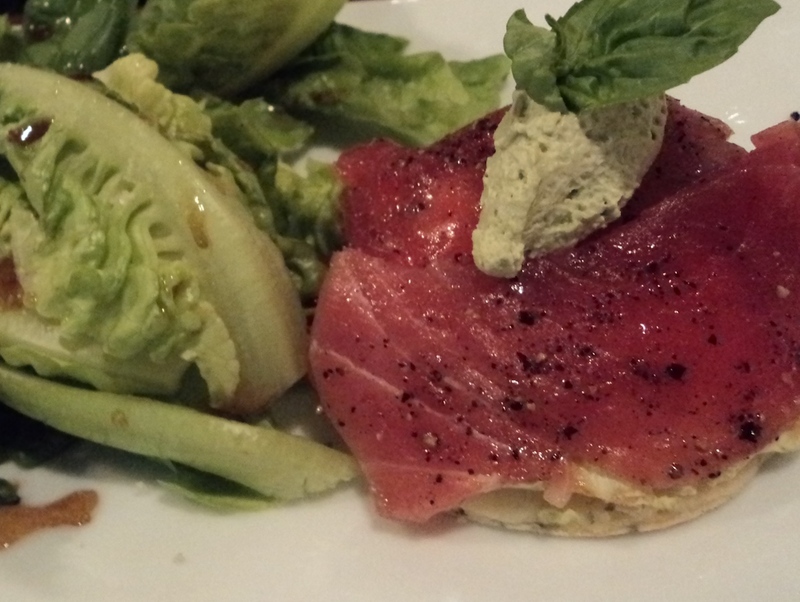 Tuna Tartare with blini and chive cream… and a fresh green salad. 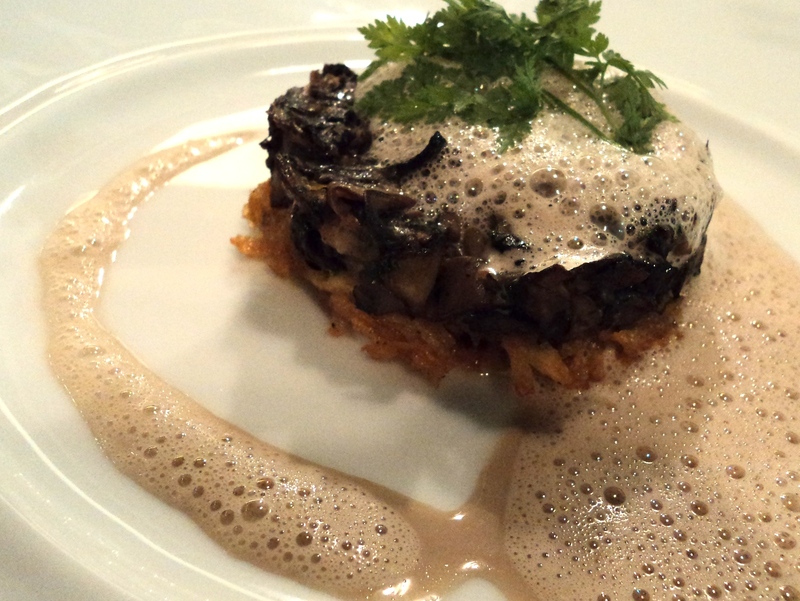 Snail napoleon – earthy, rich, beautifully presented. I tasted the accompanying sauces, and they were beautiful. Balanced, imbued with vegetable essence, gorgeous. The vegetarian main course. Home made egg tagliatelle with green capsicum and a perfect parmesan porcini foam. Subtle and luxurious, elegant and beautiful. Incredibly satisfying. The duck main course. 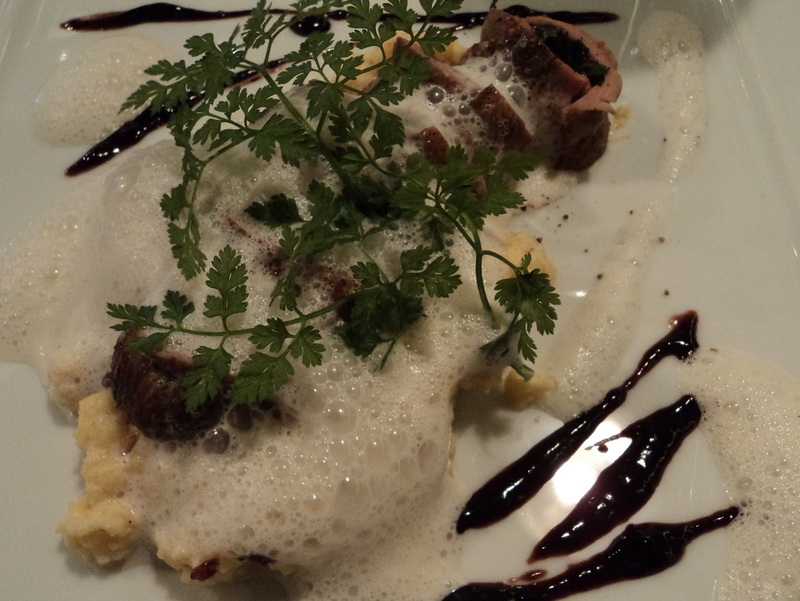 According to those who ate it, it tasted truly of duck … gamey and wild and delicious. 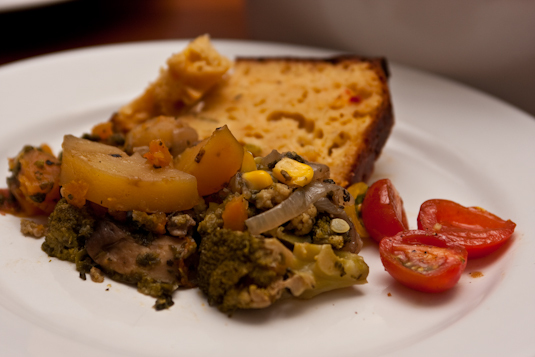 Served with a stunning hazelnut polenta and a blueberry stuffing. Clever and thoughtful all in one go. Steak. Apparently, it was perfectly cooked. With a stuffed potato on the side. I like how this looks, the juxtaposition of the meat and the potato… Smart. An intense caramel custard creme brulee – perfectly burnt crispy sugar crust, with a lime and thyme sorbet. What an interesting combination. 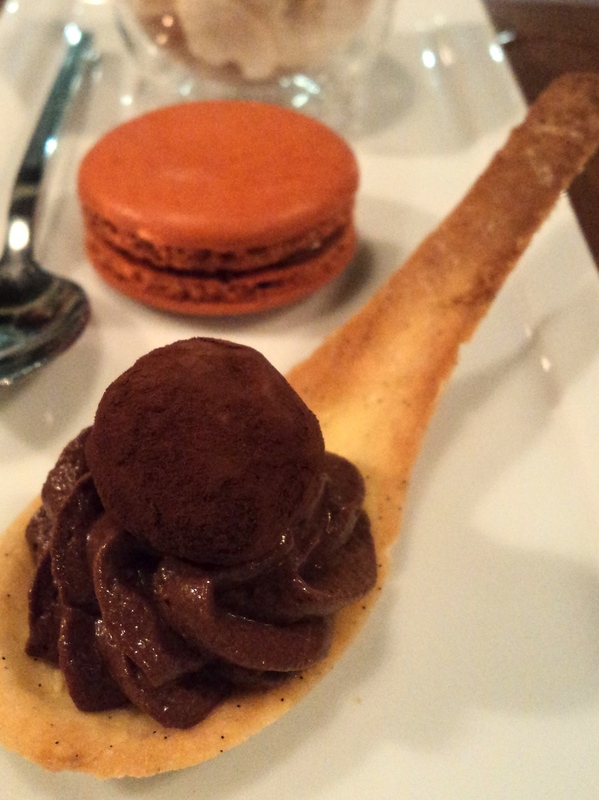 Trio of desserts – a pineapple foam, an incandescently good salted caramel macaroon, and a vanilla spoon biscuit, holding chocolate mousse, and a chocolate truffle. Mine! 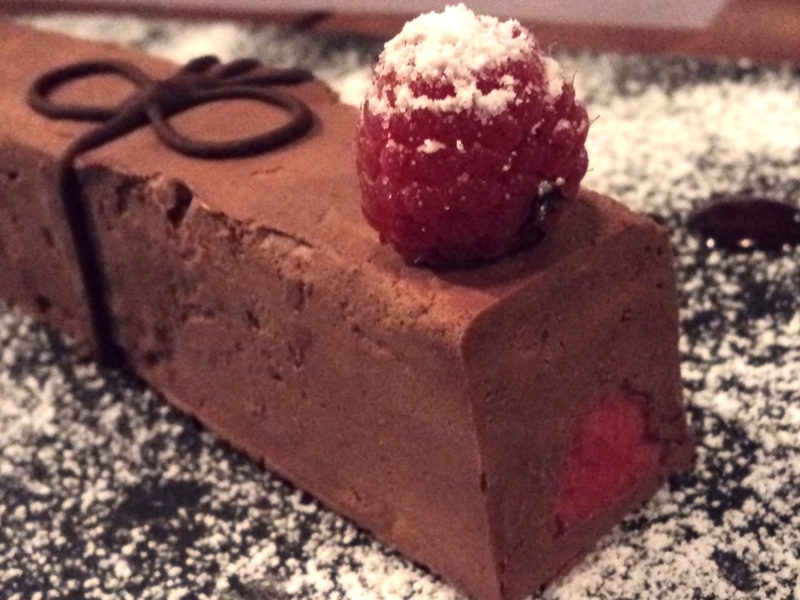 Frozen chocolate mousse “gift” with a liquid river of raspberries running through it. So so so good. I could have buried myself in this plate and just whuffled. 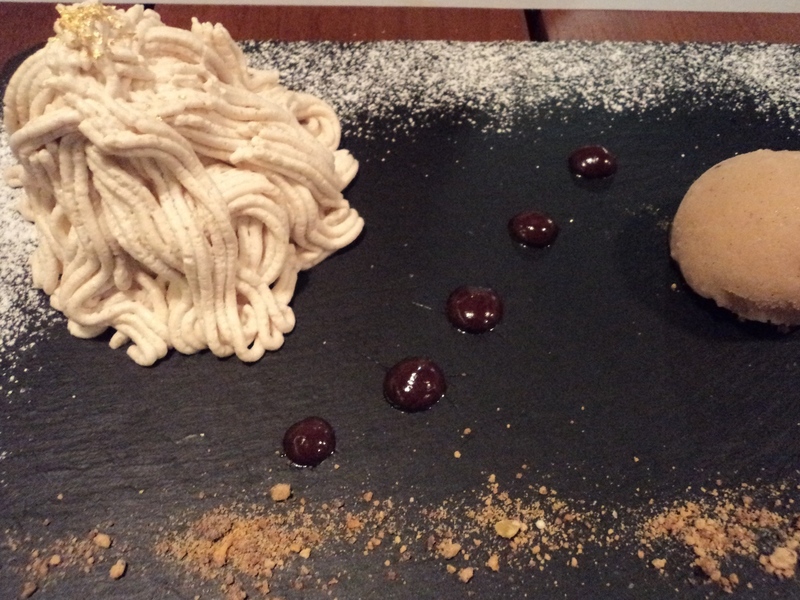 A dramatic and architectural Mont Blanc – pureed chestnuts, whipped cream and crisp meringue. So beautiful! 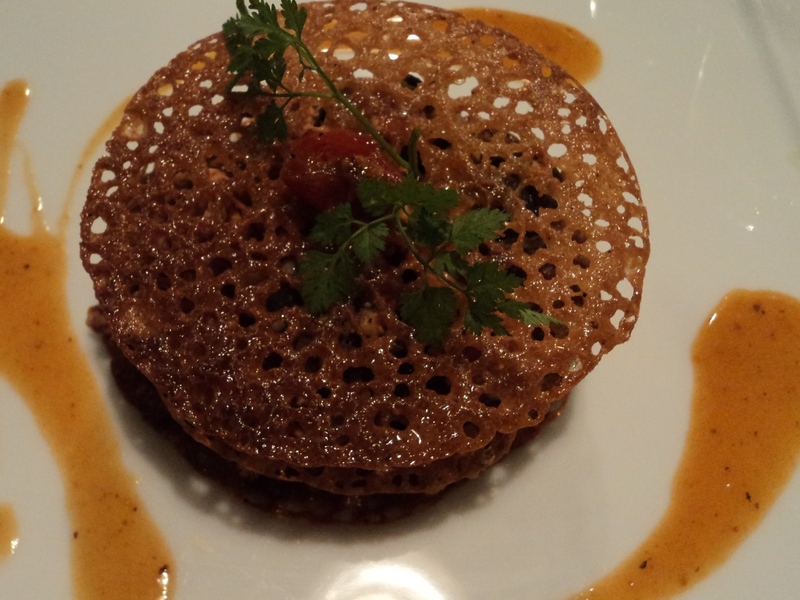 Dried fruit croquant – crisp, caramelised, sticky, delectable. Today was full on all the time. It never let up and it never stopped. M came home at 6, after a crazy work day, and the beautiful baby Z was done. M went up to put her to bed, and I knew that she would be downstairs within an hour, ready to eat something before falling into bed herself. I wanted to cook something that would be simple, warm and most of all, give us all some comfort. 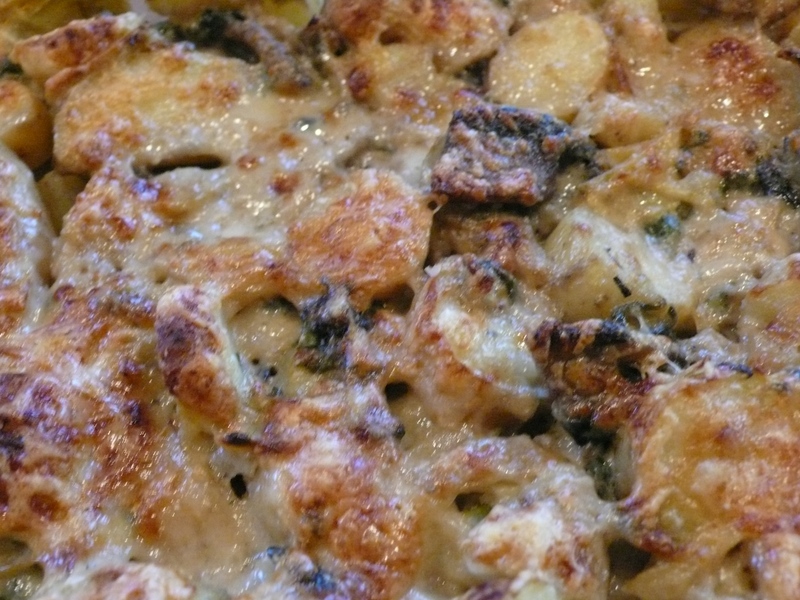 I came up with this potato gratin, using baby fingerling potatoes, with artichoke hearts, mushroom and spinach. It was good and simple, easy going down, and felt like a big hug. Just note that if you want, you can use coconut milk or almond milk, though Im not too positive that they will be great substitutions for a vegan diet. I read in a book the O sisters gave me for my birthday about whizzing up raw cashews and using their milky goodness in place of cream, but to be honest, tonight was one of those nights where I just couldnt think of vegan … we needed the proteins from the milk and cheese, and I needed to be able to pull it all together in under an hour. I put no spices, garlic, onions or flavourings into this dish. I wanted the vegetables to speak for themselves, and I wanted it to be a calming, tasty but not aggressive dish, because sometimes, during very tiring days, we just want softness and stillness. I succeeded, and the best compliment was my sister, hugging me, and telling me how happy she was to come back, from such a hard day, and have a home cooked meal waiting for her. This is what cooking is about – loving and supporting and comforting your family and friends, in a way that is fleeting but whose sayang is always remembered. This will serve 4 as a main course. Leftovers are really good the next day, chopped up, pan fried and served with an egg for breakfast! Preheat the oven to 200 C. Slice the potatoes into a large pot, cover with water, add salt, and bring to the boil. 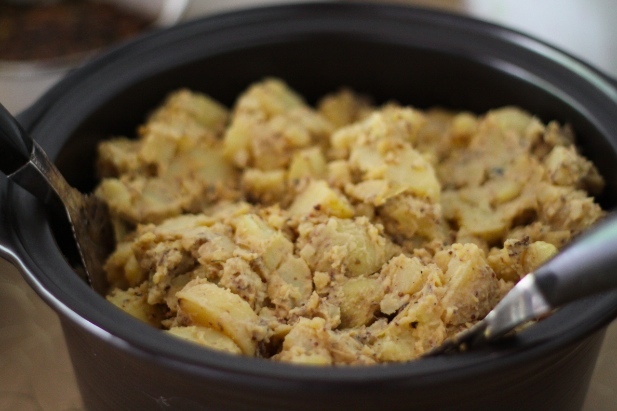 Keep simmering until the potatoes break when crushed by the times of a fork – about 25 – 30 minutes. While the potatoes are simmering, heat the oils in a frying pan, and saute the mushroom until it starts to colour a bit and burn around the edges. Add the spinach all at once, and allow it to wilt. 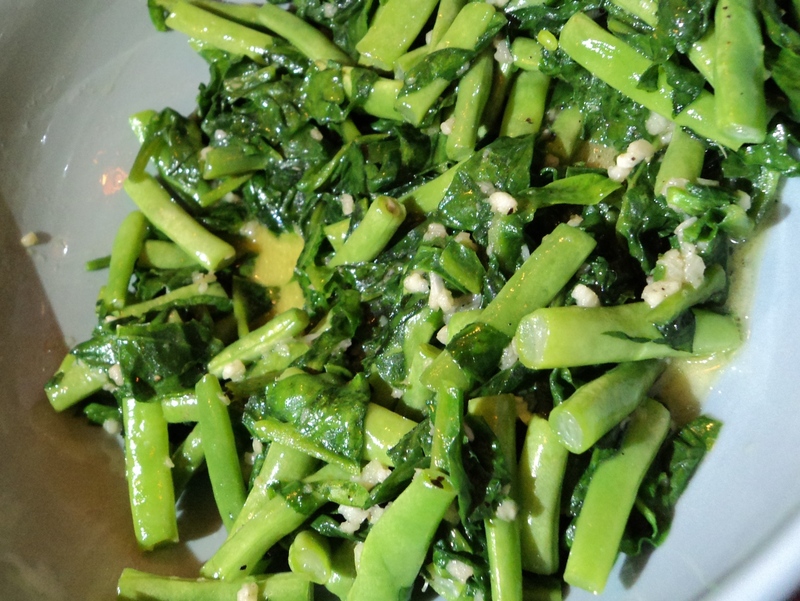 Once the spinach has softened, add the milk, and season with salt and pepper to taste. Let this mixture simmer for a few minutes, or until the milk has just thickened a bit. Add the artichoke hearts and mix well, and then add 1/4 cup parmesan. Set aside. Once the potatoes are done, drain them, and then tumble them into a small baking pan. Pour in the sauce and mix well. Taste for seasoning and adjust.Sprinkle the remaining parmesan over. Bake in oven for at least 10 – 15 minutes. You will see the liquid becoming absorbed by the potatoes. 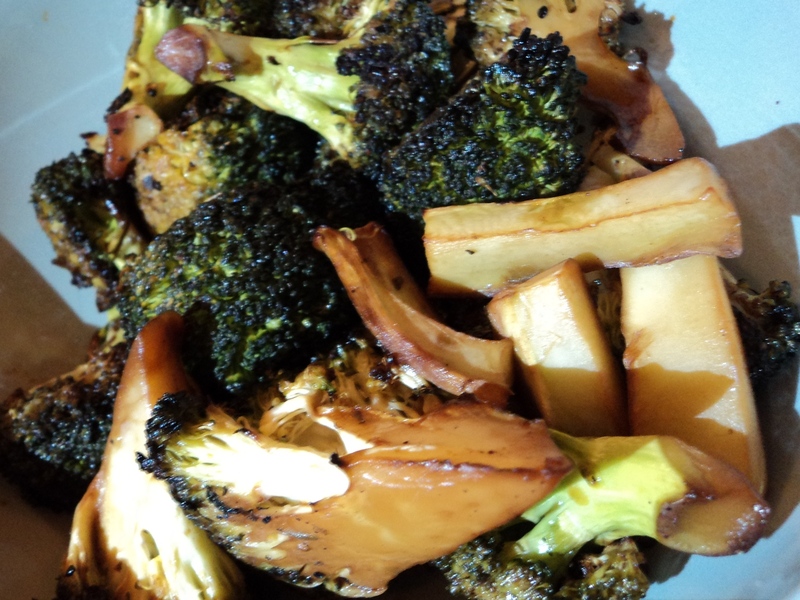 Switch your oven to broil, and allow the gratin to brown for a few minutes before serving. Enjoy the love and hug of this complete comfort meal. Tonight, I was lazy. I wanted to spend the entire evening in bed, watching videos, but of course, I needed to cook! I have made a promise to myself to post one recipe or musing every day, and so I wandered into the kitchen to be inspired. I had beets, potatoes and sweet potatoes sitting on the counter waiting for a rosti which I want to make for Ezril. I had loads of little baking paper packages of cheese bits, all wrapped up, and needing to be used. And I had some cream and milk and garlic. Okay then, instead of a rosti, which would take lots of work over the stove, I decided on a gratin. And a gratin with beets! I needed to think this through before jumping in. I think sometimes that cooking is about inspiration, but equally, it is about preparation. Even if you dont have a clear recipe, and want to be inspired by your ingredients, always, always take five minutes to think about how you are going to put everything together. If you dont, even in your head, have a clear work progress plan, you will definitely forget something or an important step. Trust me! Ive done it before, with disastrous results! Beets are gorgeous creatures, but they have one flaw (or wonderful attribute depending on your way of looking at things) – they make everything they touch turn pink! I wanted to incorporate beets into this gratin because I thought they would add an earthy unique flavour, highlighting the creaminess of the potatoes and the sweetness of the sweet potatoes. A good counterbalance. But I really needed to sit and think for a while about how I was going to keep them separate but together. So I decided to prep them all the same way, but in different bowls, and layer them instead of mix them all up. The milk/cream would bind them all together, and the cheese would act as a barrier between the beets and potatoes so they wouldnt completely bleed into each other. I think this gratin turned out gorgeously. The garlic scented the milk, but you can still taste each individual ingredient. 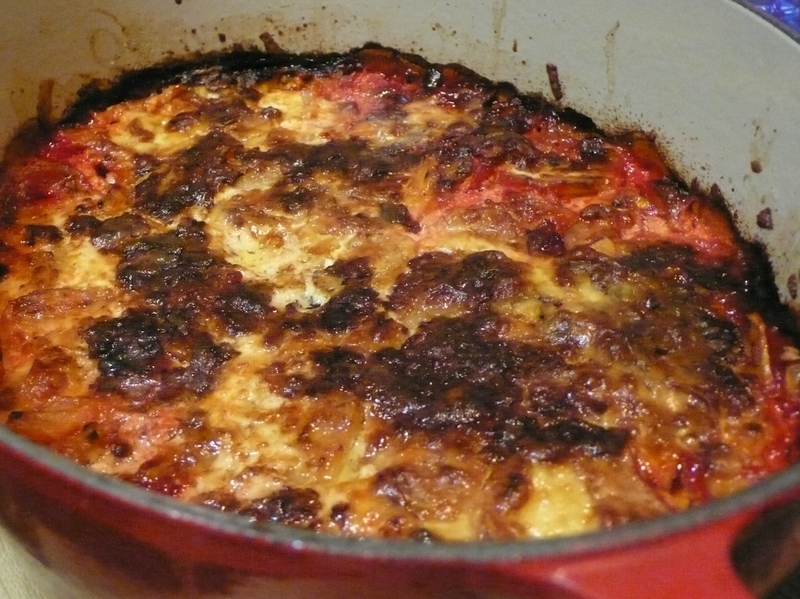 I love love love crusty burnt bits of cheese on anything, and this gratin gave me acres of it. And silky, creamy, rich potatoes. This is a wonderful side dish for a big group, or you can cut down on the amounts, and bake a small pan for just two. Its fantastic the next day, served for breakfast, cold, or sliced and slightly fried, with an egg. Its also great, served with a very tart (arugula) salad for lunch. Its comfort food, from the heart, without a huge amount of effort. Love it! The preparation is all important in this recipe. You will need to keep your beets and potato mixture separate until you are ready to bake. Peel and thinly slice your potatoes and sweet potatoes, and immerse them in cold water in a bowl. Peel and thinly slice your beets, and immerse them in cold water in a bowl. Allow the potatoes and beets to sit for at least 10 minutes. This will encourage some of the starch to come out. Boil some water, drain the cold water from your potatoes, put them back in the bowl, and slice 3 cloves of garlic over. Cover the potatoes completely with boiling water. Do the same for your beets, slicing 2 cloves of garlic over. Leave in the boiling water for 15 minutes or so. They will not cook, but they will get a little bit softer. This is what you want. Meanwhile, grate about 2 – 3 cups of cheese. I used a mix of cheddar, parmesan, mozzarella and pecorino. This was what I had in left over bits in the fridge, and what was available. Swiss cheese, like Gruyere, is more traditional, but I like the process of using up left over bits and pieces. Drain the potatoes and beets and place back in their individual bowls. Lightly butter a large baking dish. I use my high casserole dish, because I like layers in my gratin! Layer a thin layer of beets, salt and pepper them, dot with a bit of butter if you are using, and cover with some cheese. Layer some potatoes, salt and pepper them, and cover with cheese. Continue like this until you have used up all your ingredients. I usually end up with 4 – 6 layers, always trying to end with potatoes. Add a final layering of cheese over the top. Pour in about 2 cups milk/cream mixture until 2/3rd of the way up to the top layer of cheese. It will vary depending on your dish. Push everything down a bit into the cream. Bake in the oven for at least an 1 hour, possibly up to 2, checking every now and then that you dont need extra milk/cream (you really shouldnt, but add more if you think it needs it). Check to see if the gratin is done by forking a bit of potato – it should be tender, and break under very little pressure. Take out of the oven and allow to rest for at least 10 minutes before serving. One of the things M really wanted when I was cooking for her was a vegetarian curry. This is what I came up with, given the ingredients I could source in her part of the world! Curry and rice must be one of the most ultimate comfort foods for us. Theres something about the warmth and heat – the pedas and the panas – that sends a glow to the soul. Its relatively easy to make as long as you take a couple of things into consideration: make sure you think about the vegetables you are adding, and ensure they all get proper and respectful cooking time; fry the spices – you want them to release their volatile oils and infuse their scent into the whole house; make sure there is some protein in the curry as vegetarian food like this needs to be balanced; think about colour, size and texture when you choose your vegetables; and finally, know your heat (spice) limit, and stick to it! Heat in a large pan or saucepan, over medium heat, heat oil until almost smoking. Add onion, garlic, and ginger, and stir well. Season with salt and pepper. Let onion soften, this should only take a few seconds. Add red chili, stir again, and check if oil has all been absorbed. If it has, move all ingredients to the sides of the pan, so you make a well in the centre, and add a little bit more oil. Add the curry powder and spice powders and fry until they separate from the oil and the scents have been released. You will know when this happens! As soon as the spice powders have fried, stir all together, add the cinnamon, star anise, cloves, lemongrass and limau perut and stir. Add the potatoes, and stir to coat. Let the potatoes fry for a minute, and brown a little bit. Once the potatoes have browned, add a little water, and add the squash, carrots, and broccoli in stages, stirring to combine well. Add the coconut milk, and allow all the vegetables to cook to lightly cook (you dont want them boiled, but more like lightly poached). Taste for seasoning, and add more salt and pepper if needed. I have also added some brown sugar (tiny pinch) to add a deeper resonance if necessary. Add frozen peas and baked tofu and allow to heat through. Taste again. I always think curry is best reheated gently the next day, once all the flavours have had a chance to get acquainted. And always try and serve it warm, not piping hot – you destroy any flavour if you serve it boiling hot. Serve with brown rice and enjoy memories of home and family and heat and humidity.